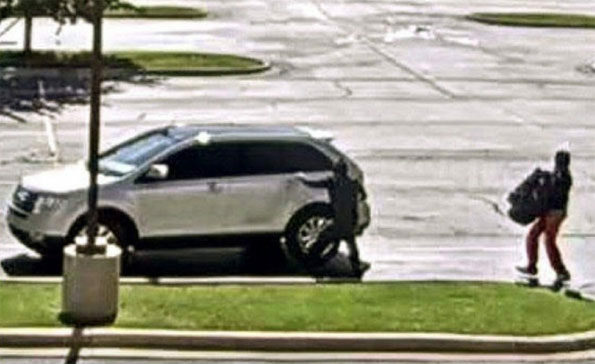 Sycamore Police Department and DeKalb County Sheriff’s Office responded about 9:40 a.m. Thursday June 28, 2018 to a strip mall address at 1792 South Peace Road to a report of an armed robbery of a Thillens armored car (armored truck). No description or confirmation of weapons used by the offenders was available. The strip mall is located at the northeast corner of Hathaway Drive and Peace Road. While the armored car crew was conducting business at the mall, two masked offenders reportedly stole money from the truck and then fled in a silver Ford Edge with dark tinted windows. The vehicle may have been driven by a third offender, according to police. After the robbery, the Ford Edge vehicle was driven from a parking space in the lot shared by Charley’s Video Gaming and Los Panchos Mexican restaurant. The vehicle exited through the parking lot of the nearby Blain’s Farm & Fleet store, which is northeast of the strip mall on DeKalb Avenue. The Sycamore Police Department and DeKalb County Sheriff’s Office conducted a search and perimeter operation of the area, but were unable to locate the suspects. The FBI is assisting Sycamore police and DeKalb County Sheriff’s Office in the investigation. Any citizens with information about the robbery should call police at 815-895-3435, or Crime Stoppers at 815-895-3272. Surveillance image shows two men wearing ski masks carrying bag of money to a silver Ford Edge SUV with dark tinted windows. The man carrying the bag of money was wearing a dark shirt, red pants and gym shoes.